At one point cubes and I were frequenting a nearby sushi spot, Sushi Zone, weekly. (I was actually going twice a week.) Sushi Zone seats a maximum of 16 people at any given time, 8 at the bar, and 8 at two booths in the window. They don't take reservations; it's first come, first serve Monday through Saturday from 5 to 10pm. Some nights people are lined up before 5 to guarantee a seat during the first shift. 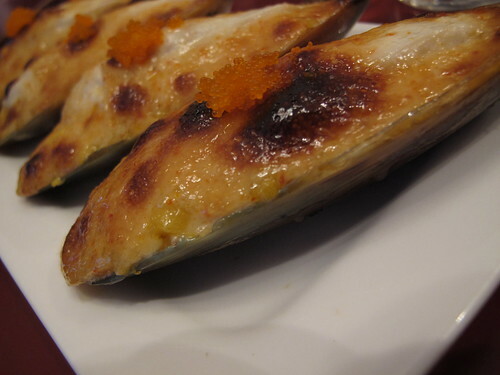 Sushi Zone is the only restaurant I know of that serves Baked Sea Bass. It's this incredible mix of Sea Bass, Mango, and a spicy mayonnaise sauce. There's something about the texture as well as the pairing of the fish and fruit that I love. I can't eat at Sushi Zone without having this appetizer. 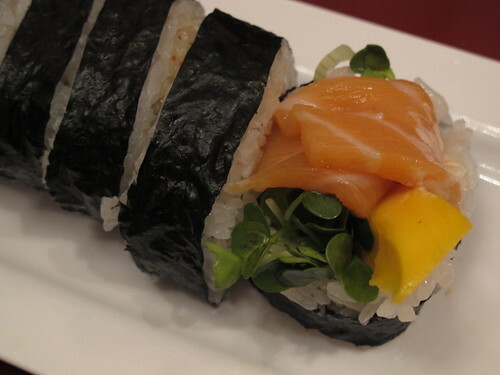 My next must have at Sushi Zone is the Mango Salmon Roll; again not a roll that you'll see at other places. Do you have a favorite sushi spot? Sushi Zone will always have a place in my heart, we celebrated here after we picked up the keys to our first apartment.